It appears that Tampax has not taken Kotex U‘s pretty ingenious marketing campaign lightly. Apparently, the reason people are buying Kotex is because of the cute little black box! And yes, that is part of the appeal — Kotex has acknowledged that aesthetics matter, and they do. They’ve shaped part of their campaign around the concept of “redesigning feminine care“, and brought sassy Patricia Field on board. But most of the excitement has come from Kotex’s ability to profit off of the idiocy of previous tampon campaigns. The irony of this ad is that Kotex has wrapped their entire campaign around the idea that traditional tampon advertising has nothing to do with what it’s actually like when a woman has her period, specifically, that she definitely does not want to run around in tiny, white clothing. At the end of the day, Tampax is probably just bitter and angry that the coolest thing they have going for them is the character of “Mother Nature” who is always lurking just around the corner. 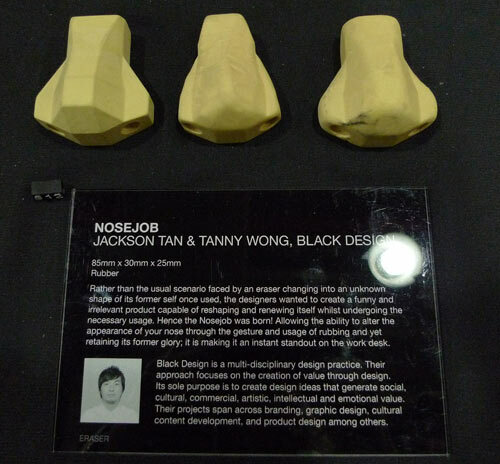 This Nosejob Eraser by Jackson Tan and Tanny Wong lets you easily create your ideal nose. Purchase here. Fun fact: Jessie and Emily saw this shirt separately and both felt the urge to document it. Smart Girls: They think alike when when they see stupid stuff.